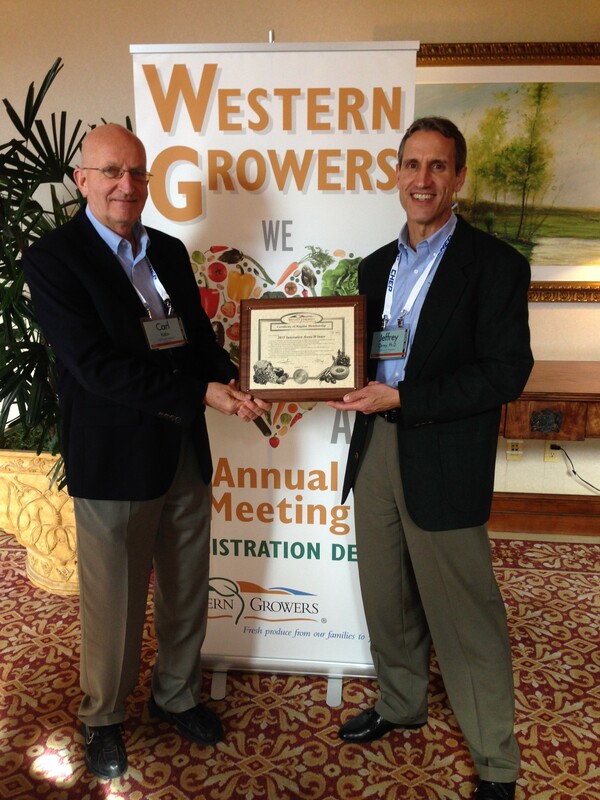 Boulder, CO – GeoVisual Analytic’s OnSight Ag platform was selected as the top agriculture technology innovation at the Western Growers Association’s 90th Annual Meeting this week in San Diego, CA. GeoVisual competed against 6 other startup finalists during what Western Growers dubbed a “Shark Tank Pitch Fest” and came away with the top award from a panel of judges that included Robert Sakata, President of the Colorado Fruit and Vegetable Growers Association, and David Petrocco of Petrocco Farms, both from Brighton, CO.
VP of Marketing Carl Kalin (left) and CEO Jeff Orrey (right) with their Western Growers AgTech Innovation Award for 2015. The Shark Tank event was part of Western Grower’s new thrust to accelerate the availability of technologies that will help their 2500 members deal with the pressing problems of producing more high quality, safe fresh produce in an era of scarce resources and intense regulatory and marketplace pressure. According to GeoVisual CEO Jeff Orrey, “Given that WGA members provide half the nation’s fresh produce, we are thrilled to have this opportunity to help. As growers face market pressures and rapidly changing conditions, the winners will be those who have an up-to-date status on their crop conditions and their expected yields, so they can respond quickly.” By winning the competition, GeoVisual will have support from the WGA to introduce its OnSight Ag technology to WGA members and will receive full WGA membership for a year. GeoVisual is a finalist in the Silicon Valley Thrive AgTech Accelerator and was awarded recognition at the Forbes AgTech Summit in July 2015 in Salinas, CA, which is considered the fresh produce capital of the country. GeoVisual’s OnSight Ag platform, developed with support from NASA, combines satellite, drone and ground-based information to improve crop production and help predict yields. Since 1926, Western Growers has represented local and regional family farmers growing fresh produce in Arizona and California and now Colorado. Its members provide half the nation’s fresh fruits, vegetables and tree nuts, including a third of America’s fresh organic produce. Some members also farm throughout the U.S. and in other countries so people have year-round access to nutritious food.